A passionate desire to make a difference in the lives of their patients is what sets Rao Family Chiropractic & Wellness Center apart as a unique and special family health and wellness provider. And…it’s the reason why Drs. 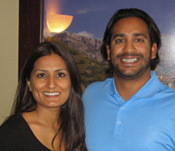 Susan and Madan Rao became chiropractors in the first place! After Dr. Susan finished up her chiropractic studies at Parker, she and Madan headed for Spain, where Dr. Susan was able to bring her own special brand of treatment to her Spanish patients. “I was fluent in Spanish so this was a wonderful opportunity for me. I am proud to say I am also fluent in English and Punjabi (an Indian dialect), with a working knowledge of Hindi.” When they returned from Spain, Dr. Madan began his chiropractic education at Parker College of Chiropractic. So what brought Drs. Susan and Madan to Bee Cave? We provide chiropractic care for spines of all ages! Dr. Madan enjoys working with all types of health challenges, but he especially likes caring for patients with sports injuries or problems with their extremities, such as their shoulders, knees, and ankles. How do Drs. Susan and Madan advance their own healthy lifestyles? In their “downtime” hours, Drs. Susan and Madan like to watch and play sports (Dr. Madan likes basketball, volleyball, running and cycling while Dr. Susan likes soccer, running, weight training, spinning and yoga). They also love to travel and experience different cultures from around the world. They invite you to call them and to visit their office so you can discover the life you were meant to live – a life free of pain and discomfort and full of health and the vibrant energy that millions of others under chiropractic care have already come to know.